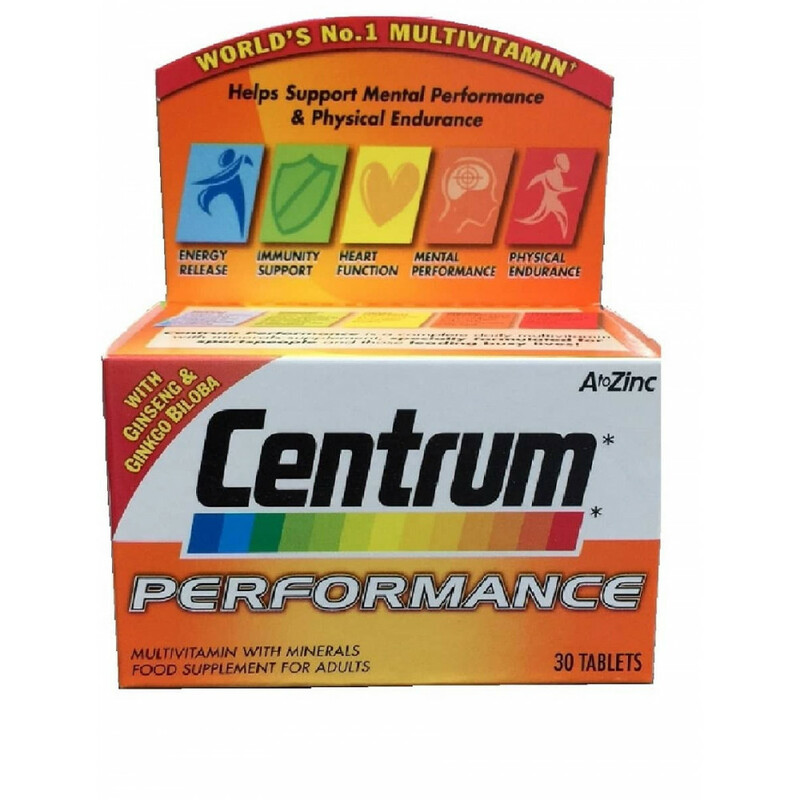 Centrum Performance is a daily multivitamin and mineral supplement suited for those who require more than your average multivitamin. It is suited for those regularly exercise or play sports. Would benefit those who have an active lifestyle. Formulated by those with 30 years of nutritional expertise. Do not exceed the stated daily dose of one tablet. Not suitable for during pregnancy or breast feeding. 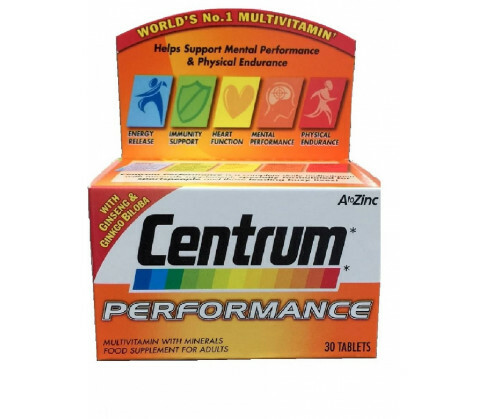 This product contains iron and in large doses can be harmful to young children. You should read product packaging and labels before using. Take one tablet daily with water preferably with food. No more than one tablet a day. Calcium Hydrogen Phosphate; Potassium Chloride; Vitamin C; Bulking Agent E460; Calcium Carbonate; Magnesium Oxide; Ginseng Extract, Ginkgo Biloba Extract, Gelatin, Ferrous Fumarate, Niacinamide, Stabiliser E1201, Vitamin E, Bulking Agent E464, Starch, Calcium Pantothenate, Managanese Sulphate, Zinc Oxide, Vitamin B6, Silicon Dioxide, Sucrose, Vitamin B2, Emulsifiers, Magnesium Stearate, Stearic Acid, E433, Vitamin B1, Beta-Carotene, Modified Food Starch, Cupric Sulfate, Chromium Chloride, Vitamin A, Thickener: Acacia Gum, Folic Acid, Lactose (from milk), Sodium Selenate, Sodium Molybdate, Potassium Iodide, Partially Hydrogenated Vegetable Oil, Biotin, Vitamin K, Vitamin B12, Vitamin D, Colourants E110, E171, E129.